You are here: Home / How To / How to Manually Update Bitdefender 2013 Virus Definitions Offline? One can manually update the Bitdefender Virus Definition database offline using weekly.exe application. Please note that this will update only the Virus definition and not the product updates. If you wish to install product updates, just connect to the internet and proceed for updation. Download this file (for 32bit operating systems) or this file (for 64bit operating systems) and save it locally on your hard disk. Open the downloaded file to start the setup wizard. Check I accept the terms in the License Agreement and click Next. 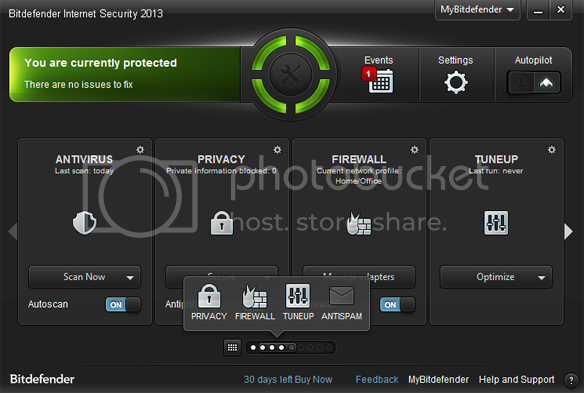 MyBitdefender dashboard: This is one of the cool feature of Bitdefender :). You can see all the status and licensing information about your software and services in your own MyBitdefender dashboard. Shop and bank confidently: Bitdefender Safepay™ safeguards your payments and also automatically fills in your account information. Stops Irritating Popups: Bitdefender Autopilot™ provides a hassle-free experience by making optimal security-related decisions with no input from you. This means no pop-ups, no alerts, nothing to configure. : The two-way firewall continuously monitors your Internet connections and prevents unauthorized access, even over a Wi-Fi network. : It’s a proactive, dynamic detection technology. It monitors processes’ behavior in real time, as they are running, and tags suspicious activities. : Immunizes any Flash Drive from viruses when they’re connected to your computer so you never worry again about USBs infecting you or your friends. What’s Good & Bad About Bitdefender? Automatically warns you about suspicious websites. Protects your privacy on social networking sites. Scans and cleanup may take long but gets the job done.